Acora was born and raised in Baltimore City. Shegraduated from the Institute of Notre Dame in 2016. Throughout high school, she was a cheerleader which taught her importance of teamwork. She was also a member of Project Kind. The organization is an after school program to help fellow students with homework, and prepare craft projects for local elementary school children. Acora appreciated the idea of sisterhood and tradition that she experienced during her time at the Institute of Notre Dame in 2016. Acora Joined the Miller and Zois team in July of 2016 as a file clerk. She handles incoming and outgoing correspondence and makes sure the files are in tip top shape. While her top priority is organization, she assists with many other special projects and day to day tasks. She helps to answer incoming calls and conducts intakes as time permits. She can occasionally be found working on a special project at the Health Care Alternative Dispute Resolution Office and at courthouses around Maryland when legal documents need be filed. Acora is a sweetheart and always greets everyone with her smile. 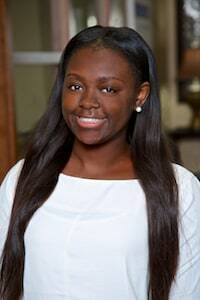 Acora plan is continuing her education and hopes to become a sonographer, as she loves the medical field. Working with the Miller & Zois team has unquestionably taught her a great deal about the legal field, as well as the medical field. When not working, Acora spends her free time with friends and family. Acora loves to have girl time with her mom, who is also her best friend. Acora enjoys an array of activities from shopping, spending time in the city she loves, and traveling.